You have given the saints in heaven eternal happiness and they now live in the fullness of your glory. Because of their holy love for you, they also care about me and my family, my friends, my church, and my neighbors. Thank you for the gift of their friendship and the witness of their holy lives. 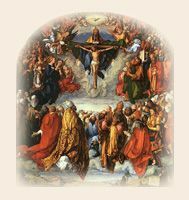 I ask our patron saints and every saint who has become especially dear to me to intercede for us. I ask them to help us journey safely on the narrow path that leads to heaven. O Lord, give us their protection. Grant us their assistance in overcoming temptation and gaining the fullness of life with you.